Australia is flooded with "too good to be true" refinance offers. Rejections up 349% since April, 1426% from December. Looking to refinance your Australian property you wish you didn't buy? Not to worry, I can help is the message banks are sending. Oops, strike that. 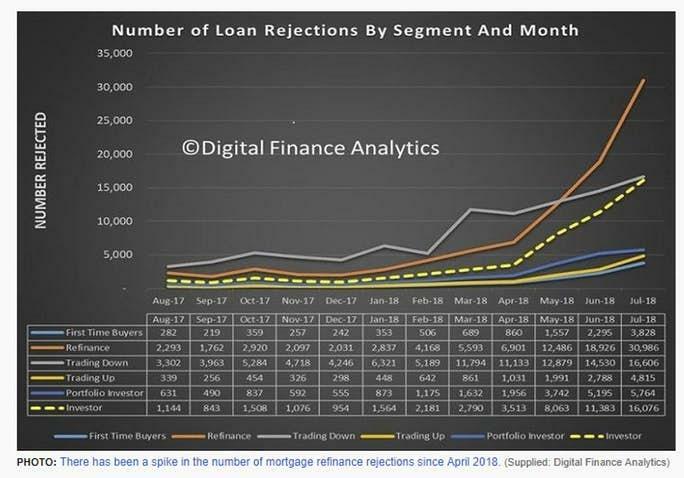 The total number of monthly rejections went from 2,031 in December 2017 to 30,986 in July 2018, a mere 1426% increase. The rejection rate itself looks much better percentage-wise. It's now 40%, up from 5% a year ago. Those who cannot refinance are in deep trouble. The Spike Exposes the Number of Australians in Debt Distress. It's being described as a "mortgage mirage". It's an offer from the bank that looks too good to be true and, as it turns out, for many it is. "About 40 per cent of people who tried to refinance were unable to do so," Digital Finance Analytics principal Martin North said. "If you go back a year it was 5 per cent." The reason this is occurring is that, while those applicants cleared the bar for their original loans, that bar has now become a lot higher, following years of banking reform and the fallout from the banking royal commission. So, now, they simply don't qualify for the same amount of debt they once did. "People were getting loans on the basis of a four person family having $30,000 a year of living costs living in Sydney. "And it's quite clearly impossible to live in Sydney on that much money a year. "The biggest issue is that people have borrowed too much money relative to their income and that is a very difficult problem to unwind." 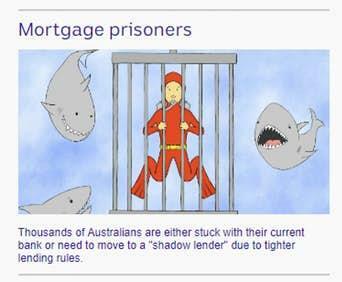 One million mortgage prisoners are on the edge. They either need to come up with more money or sell. But sell to whom? And at what loss? Please recall 13-Year-Old Kid Buys $552,000 Home. I asked "What can possibly go wrong? I don't know if it did go wrong yet, but if that genius bought more homes as was his intention, it will. I seem to recall events like this happening somewhere else, where banks lent money to anyone who could breathe, whether or not they could afford what they were buying. When was that? Where was that? Was there a crisis? Did anyone learn from it? Darn, I just can't recall.